Yorkshire – The White Rose County or as I am sure you prefer ‘Yorkshire – God’s Own County’ attracts a wide range of merchandise and there’s nowt wrong with that if it helps the Yorkshire economy. Take Tea Towels as an example (not just a device for drying the pots) from Yorkshire Linens. 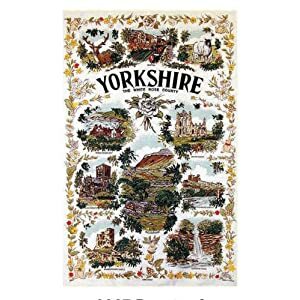 Available are designer tea towels such as Yorkshire Born & Bred, Yorkshire Pudding Recipe, War of the Roses, Yorkshire Map, Scarborough railway poster tea towels and a Harrogate scenes .